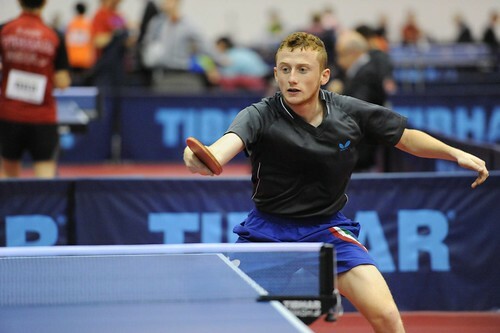 Wednesday 24th May saw the 2017 Polish Junior and Cadet Open commence in Wladyslawowo–Cetniewo, and already after just a single day of play there has been a big shock result in the Junior Boys' Singles category as the second seed Rares Sipos made an early exit from the competition. Romania’s Rares Sipos was expected to be one of the main title contenders heading into the event, but he has surprisingly failed to progress beyond the Round of 64. With the help of the home crowd Artur Grela, who began his campaign in the qualification group stage, claimed a tremendous victory against Rares Sipos (12-10, 11-8, 8-11, 10-12, 8-11, 11-8, 11-8) to bring his action-packed day to a fantastic conclusion. “I was full of faith before game, I didn’t think about losing, and when Rares Sipos was winning 3-2 in games I tried to change the situation. It was a very hard match”, Artur Grela. The only other Polish player to successfully move through to the Round of 32 is Kamil Nalepa, following his six games triumph over Tibor Spanik of the Slovak Republic (11-9, 11-4, 8-11, 9-11, 13-11, 11-4). Italian competitors enjoyed a good outing in the last 64 as Antonino Amato, Carlo Rossi and Matteo Mutti progressed. Without dropping a single game Antonino Amato comfortably beat Romanian opponent Paul Mladin (11-9, 16-14, 11-8, 11-3), while Carlo Rossi registered a similar games scoreline in his encounter against Hungary’s Patrik Juhasz (11-5, 11-7, 12-10, 12-10). Matteo Mutti required five ends to see off Chen Chun-Hsiang of Chinese Taipei (5-11, 11-4, 12-10, 11-3, 11-3). Top seed Cristian Pletea came extremely close to an early elimination from the Junior Boys’ Singles event after the Romanian was forced to comeback from three games to one down to defeat Portugal’s Samuel Da Silva across seven games (9-11, 11-13, 11-9, 9-11, 11-7, 11-6, 11-8), while five of Japan’s representatives also qualified for the Round of 32. The Junior Boys’ Doubles tournament produced a number of highly exciting matches in the Round of 16, as four of the battles required the full games distance. Fifth seeds Kazuki Hamada and Shunsuke Togami of Japan recovered from a difficult position to achieve a victory over Italy’s Antonino Amato and Daniele Pinto in the deciding game (5-11, 11-5, 10-12, 11-5, 11-6), and another eye-catching duel saw the Swedish pairing of Martin Friis and Truls Moregard stun the seventh seeded partnership of Russia’s Artur Abusev and Anton Kotov (11-4, 6-11, 7-11, 11-3, 11-8).